Canada, Indiana, and Connecticut. Some are taken at home, others on vacation or while traveling. Over time, beginning when they were young children. Pictures are included from when they were toddlers, to young adults, to adults. 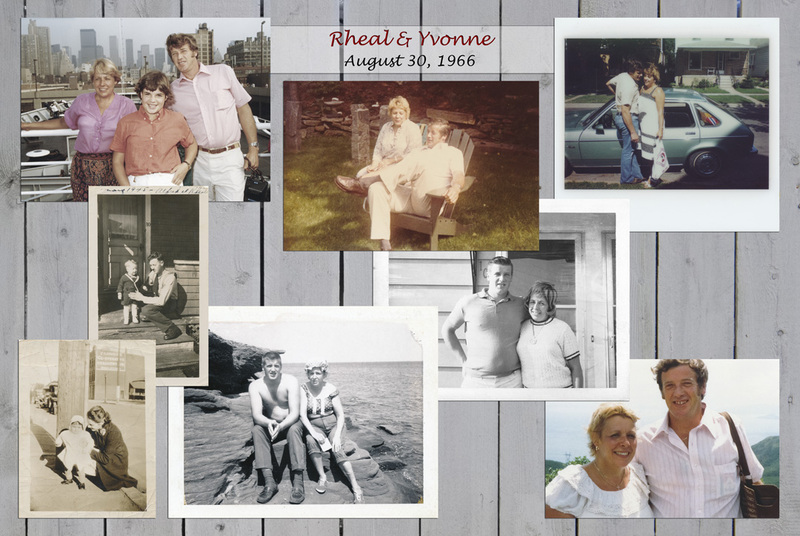 I wanted a collage for their 50th wedding anniversary. I love this collection of pictures because they capture happy times in my grandparents’ lives. It shows the evolution of their relationship and is a rememberance for them on their 50th anniversary. Here at cShoresal, we think the Melansons are fortunate to have a grandchild as thoughtful as Jade in their lives! We started out with an envelope full of old photos. After scanning them in, cleaning them up, and reviewing some possibilities, we decided on the collage idea rather than putting each image on a separate, smaller panel. Having it all in one makes a statement, and also makes it easier to hang on the wall. A custom panel like this is a big project, but as you can see, well worth the investment! Sally has done a phenomenal job. With any of the projects I plan in the future I will not hesitate to come to her! She not only got the project done but did so using her own creativity in impressive timing. Can't thank you enough for this! My daughter is so sentimental at 22! What a beautiful soul and to see her honor her grandparents is so touching. If I ever have any printing projects in my future, I will use your services as well! !